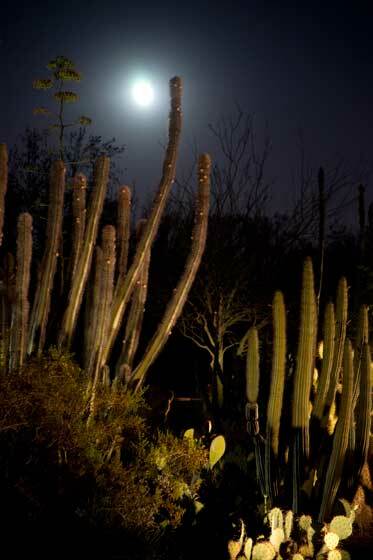 This photo collection was taken at the Desert Botanical Garden in Phoenix, AZ on a moon lit night. I used a light painting technique where you shine the outer edge of a flashlight beam (not the full center light) on to your subject for about 1/3rd of your exposure time. So for the 15 second exposure you leave the flashlight on for about 5 seconds. Then you turn the light off and continue with the exposure. 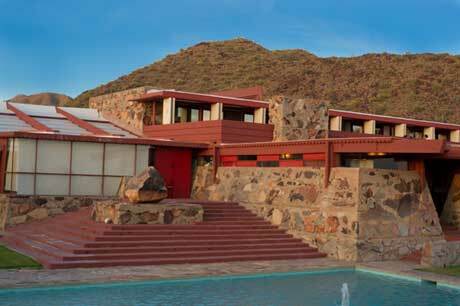 This provides enough light to highlight the subject without making it appear as though it was day light. These photographs had the advantage of a full moon night so there was an additional source of light that a moonless night would not provide. 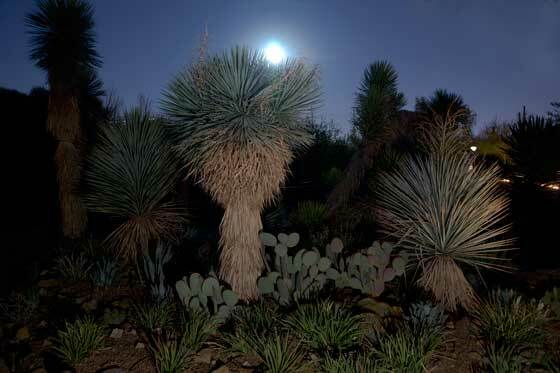 In addition, the garden is in the city so the ambient light was brighter than it would be in an isolated or rural area. 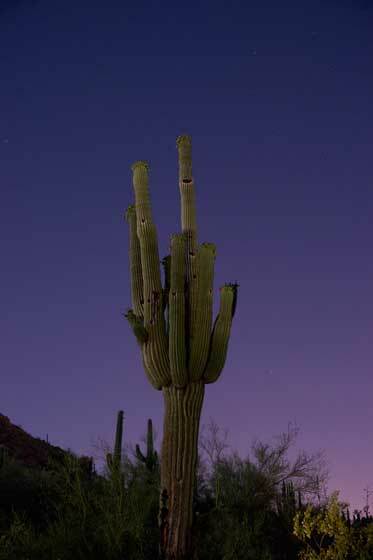 You will need to keep the other sources of light in mind when deciding how long to leave the flashlight on the subject. The 1/3rd is just a guideline, not a rule. 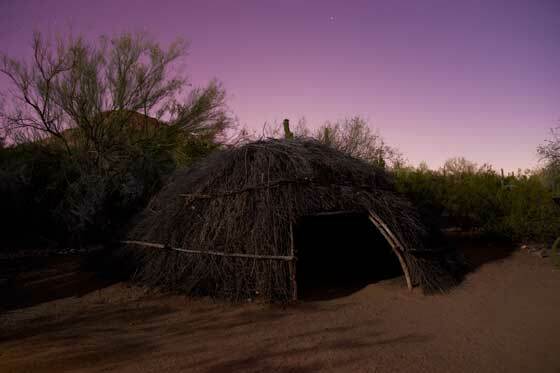 Experiment with different exposures and amounts of time you leave the flashlight on to see what works best for your subject and lighting conditions. Sometimes you have a once in a life time shot but it is on a grey and dreary day. Or you have to get a building photographed and the deadline is fast approaching so you can’t wait for the perfect sky to appear. Or in order to get the scene perfectly exposed you sacrificed the sky. In all of these situations you may feel like you photograph is sub-par because the sky distracts from what would otherwise be a great photograph. But fear not. There is a quick and easy way to replace your bad sky with something that does the image more justice through Photoshop. And you don’t have to be a Photoshop wiz to accomplish this. 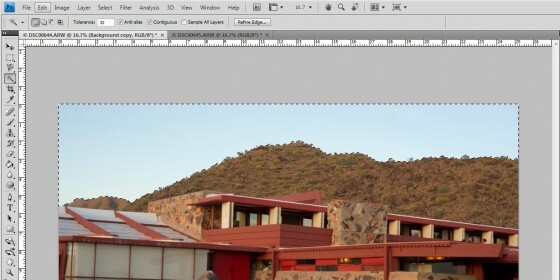 Here is a step-by-step guide to replacing the sky in your digital images using Photoshop. 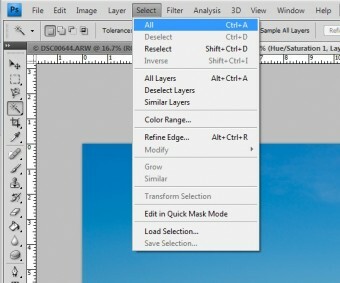 1) Open your image in Photoshop. 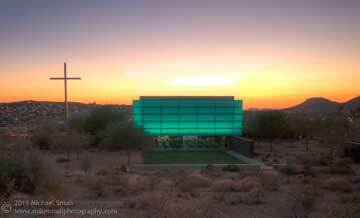 We are going to replace the sky before resizing, cropping or making other adjustments. 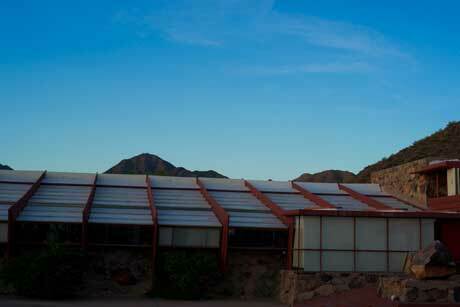 As you can see in this image taken at Taliesin West in Scottsdale, AZ the exposure was optimized for the building itself which left the sky a bit washed out. 2) Now you need to find your perfect sky image. It should be one that you exposed for the sky. The rest of the image doesn’t matter. You also want an image that has a good portion of sky in it, 1/3rd or more if possible. You may want to keep a few “prefect sky” images in your files to use when a sky replacement becomes necessary. 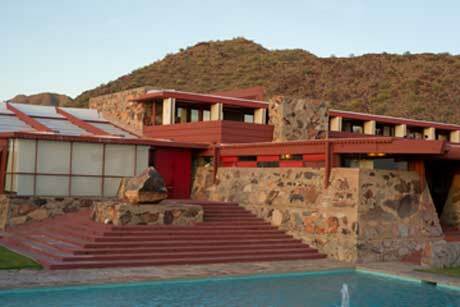 For this example we will use another photograph take on this same visit to Taliesin. Go ahead and open this image as well in Photoshop. 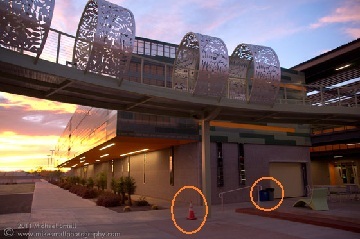 3) Now that you have both images open you want to select all on the replacement sky image and copy it. 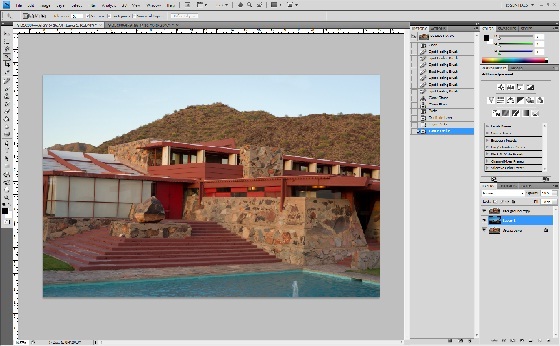 4) Now go to the image you want to replace the sky in and do and Edit>Paste. This will create a new layer containing the image with the replacement sky. 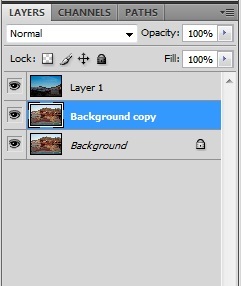 5) Next you will create a duplicate copy of the original background layer by right clicking on it and selecting Duplicate Layer. This is just a good practice so that you are not making changes on the original should you need to go back. 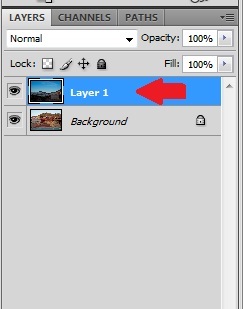 6) Click on the Background copy and drag it to the top of the layer list so that it will also now be the image you see on top of the main screen. 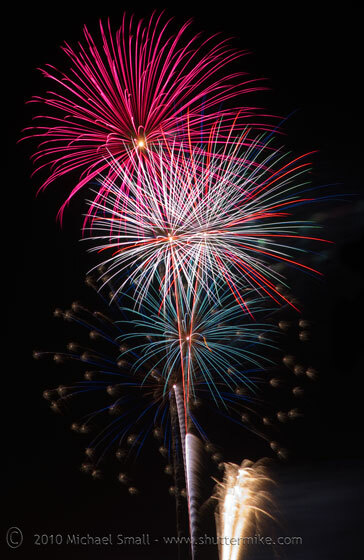 7) Using the magic wand tool you will now select the sky in the original image. Depending how rough the edges are in your image you may want to refine the edge by a couple of pixels to make sure you get everything. 8) Select the eraser tool and change the brush size to something rather large and the opacity to about 30-40%. Starting at the top of the image run the eraser over the selected area removing the sky in the one image a revealing the replacement sky form underneath. You may want to repeat the erasing a few times to reveal darker sky at the top and then fade it down. 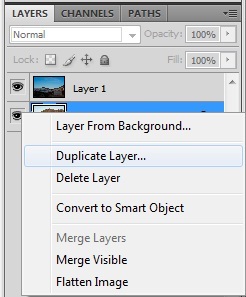 9) Last thing to do is to deselect the sky and merge your two layers into one. And there you have it, a perfectly exposed main subject and a beautiful sky as well. 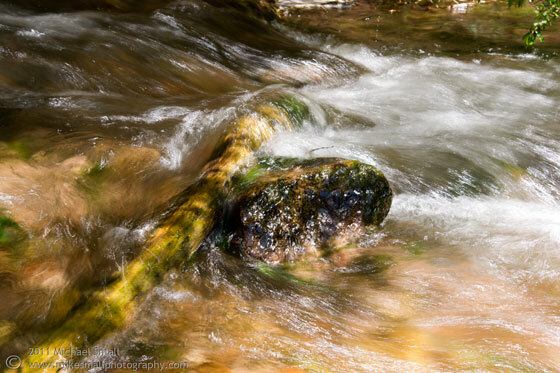 When photographing flowing water such as a stream, river, waterfall or the like you have two choices. 1) Stop the motion of the water or 2) show the water’s motion. Both of these are accomplished through the exposure settings you select. It is pretty basic actually. When you want to stop the motion of the water you need to increase your shutter speed and open up your aperture (smaller f-stop). 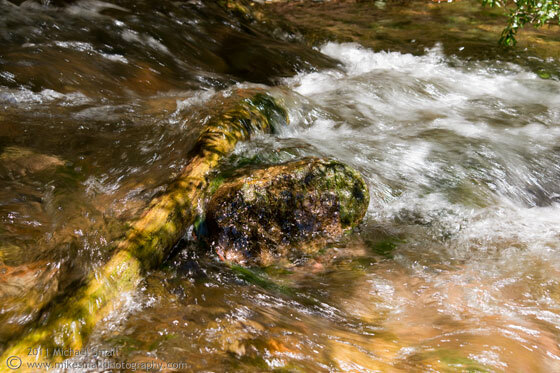 The faster shutter speed will result in freezing the water’s flow while the wider aperture will help make sure you are still getting enough light to the sensor to properly expose the scene. For showing the motion of the water you do the opposite. 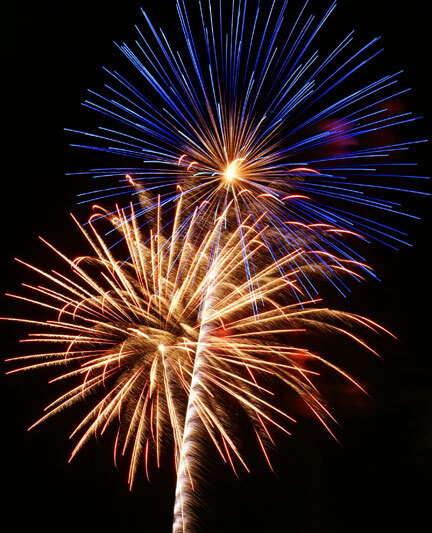 Decrease your shutter speed to get a longer exposure and close down your aperture by selecting a larger f-stop (smaller opening). The slower shutter speed allows for the blurred water effect indicating motion while the smaller aperture compensates for the increased shutter time by letting in less light to prevent overexposure. 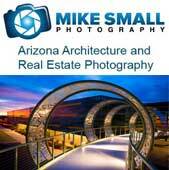 These two photographs were taken at Aravaipa Canyon in Arizona. 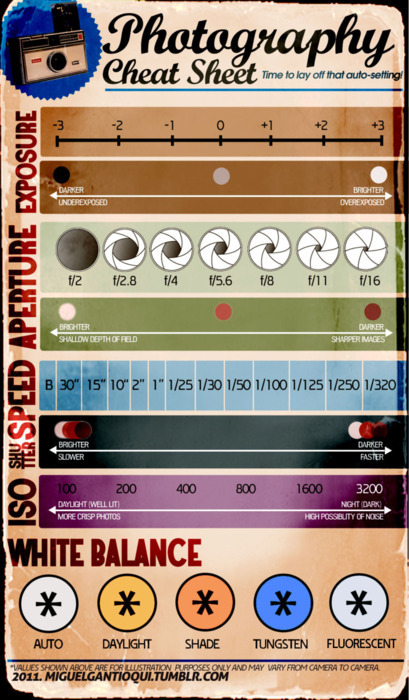 Although they follow the basic premise outlined above I would have liked to have gotten more pronounced results by decreasing the shutter time on the one and increasing it on the other. But the hike had to go on and I was a bit rushed. 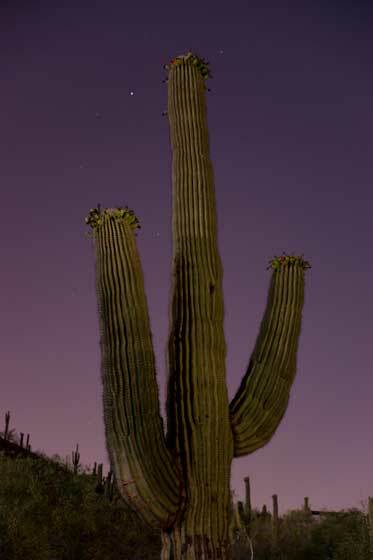 or two and prevented over exposure by taking the aperture up a stop or two. my shutter speed even more and brought my f-stop down if necessary.